Ranveer has been asked to bulk up by Rohit who wants to present Ranveer in an all new macho avatar. And looks like Ranveer has gone the distance for Simmba. 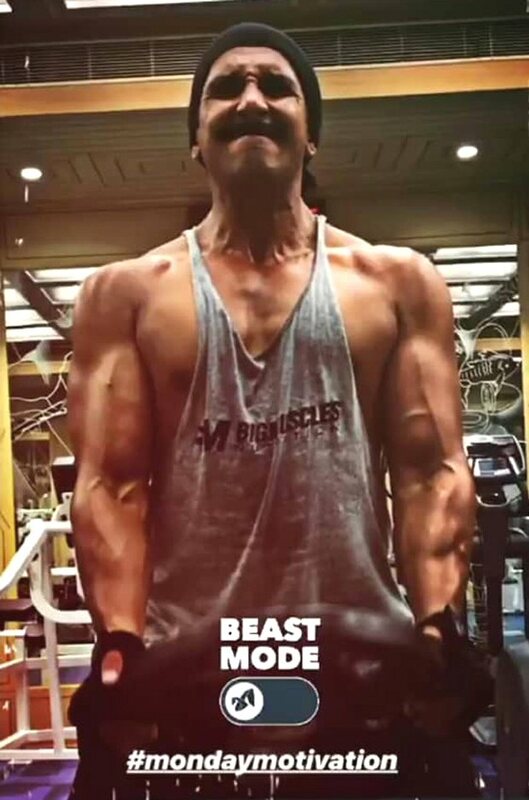 The filming has been happening in Hyderabad and despite the intense shooting schedule of the film; Ranveer has been hitting the gym every single day to ensure that his body stays in top form through the shooting of his biggest release yet. Ranveer is known for pushing his limits and transform himself in every single film and looks like he wants to present himself as a hard-core cop in this most anticipated cop drama of 2018! Aside from Simmba, Ranveer will be seen in Zoya Akhtar’s Gully Boy, Kabir Khan’s 1983 based on star cricketer Kapil Dev. On personal front, he is set to marry his long-time girlfriend and Padmaavat co-star Deepika Padukone. While the couple never came on record about their relationship, it is implied that they will sure have a fairy-tale ending to their filmy romance and solid courtship of over four years.